Novel, supplementary test method for the testing of surface cleanliness by means of suction extraction (air) by suction of dry and adhesive particles of large surfaces or of control areas on workpiece carriers or process environments. The particles are dissolved by the suction principle by means of a suction nozzle, brush nozzle or surface nozzle from the surface and sucked off. The particles can be separated by the cyclone unit or can be extracted directly to an analysis filter. 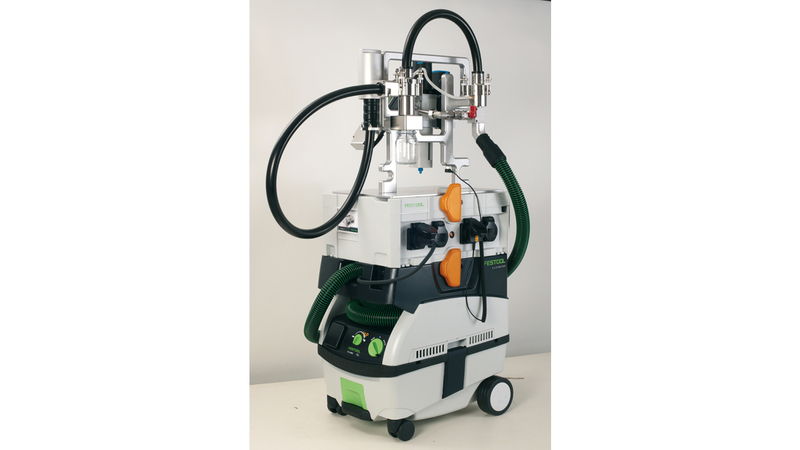 The mobile complete system is suitable for cleanliness tests by suction extraction on site of large-area components, in the logistics environment, e.g. of packaging, storage and transport containers, of non-wet materials, e.g. Styrodur containers, in production processes, e.g. workpiece carriers or in the goods receipt inspection of large components. Low operating costs due to the elimination of liquid extraction media and their filtration, lower time, manipulation and logistical efforts due to the mobile and independent system are the main important features for this novel test method by suction extraction.